The fuel flow gauges quiver as the aircraft accelerates on full afterburner, the attack radar scope glowing its bright orange, and it is an incredible sensation being strapped into the right hand seat of the awesome F-111C, even if it's only a simulator. I was given a unique opportunity, thanks to the RAAF, the opportunity to get a very close look at the fearsome F-111. The aircraft that struck with impunity at the very heart of the world's deadliest air defence system, yet so often denigrated by the ignorant, blind to the virtues of so potent a weapon system. The F-111 is a sophisticated and highly effective aircraft, and I hope the following account will serve to demonstrate that beyond any doubt. The home of the F-111 in Australia is RAAF Amberley. Amberley is the largest of the RAAF's bases and is situated very close to the somewhat colonial Ipswich, in Queensland. Amberley is however, a very modern installation; the base itself covers over 900 hectares and supports, including dependents, around 10,000 personnel. Support tasks are handled by the Amberley Base Squadron, as is customary at most RAAF installations. Amberley is home to several operational units, the most notable being the F-111 strike units (formerly 82nd Wing), Nos 9 and 12 Sqns, operating the UH-1 and CH-47 respectively and the very significant No 3 Aircraft Depot, which provides depot level maintenance to the F-111 and the Amberley based helos, aside from other types. Amberley is a soft installation, devoid of conventional or nuclear hardening, though it is equipped with an AN/TPS-43 Air Defence System. This is due to the role the base plays in RAAF strategy, primarily as a support installation. Combat aircraft are then deployed from Amberley to their respective theatres of operation to undertake combat missions, were it required. Amberley has facilities to support the F-111 with flightline maintenance, intermediate level maintenance and complete depot level maintenance, airframes and engines. Flightline maintenance is provided by the F-111 squadrons and is very basic. Intermediate level maintenance is provided by the 550 strong No 482 Sqn, responsible for avionic systems and the F-111 simulator facility. No 3 AD is then responsible for the airframes, including surface finishing down to bare metal, and the TF30 engines. Flying the F-111 is the task of the Amberley strike force, comprising Nos 1 and 6 Sqns. No. 6 Sqn is responsible for operational conversion, photographic reconnaissance and aerial survey (using a leased Lear 35), with a complement of three F-111Cs, four F-111As and four RF-111Cs. The unit flew Canberras, converted to F-4Es in 1970 and subsequently converted to the F-111 in 1973, upon aircraft delivery. Active strike missions are the responsibility of No 1 Sqn, which operates twelve F-111C aircraft, for both air to ground and maritime strike. Much like No 6 Sqn, No 1 Sqn operated the Canberra, converted to the F-4 and then F-111. Strike is the primary mission of the F-111. Strike as such is a rather broad definition of an operational role for an aircraft; in this instance it encompasses medium and long range interdiction of surface targets. As surface targets we may then view all installations associated with military operations and their respective infrastructures. This means bases, depots, communication nodes, power installations, bridges, railways, marshalling yards, massed ground forces, armour or personnel, naval bases, docks, submarine pens, ammunition dumps. The counter-air role is included, with air bases, runways, support installations and parked aircraft on the hit list. Defence suppression is another aspect of the mission, as the air defence facilities associated with these targets may come under consideration as targets themselves, very much subject to circumstances. All weather Close Air Support may be provided for advancing ground troops, however this is viewed as a secondary mission. Maritime strike then involves simply the sinking of any vessels deemed to be targets. It is significant that the F-111 is and will be the only aircraft in the RAAF inventory with the payload/range performance, pinpoint accuracy and penetration aids to successfully perform this mission in all weather conditions. Even the new F-18 with its multimode radar, accurate INS and FLIR/laser pod will match the F-111 only in accuracy of delivery at short and medium ranges, lacking the low level performance, payload, range and penetration ability. The F-111 performs the mission superbly, penetrating defences at Mach 1 speeds, hugging terrain contours at 200 feet using Terrain Following Radar (TFR), effectively disrupting enemy defences via the use of its sophisticated jamming equipment and finally hitting the target with free fall or Precision Guided Munitions (PGM). The following should provide a better insight into how the aircraft meets these objectives. The F-111 was optimised for high speed low level flight and this is reflected in every aspect of the aircraft's design. Aerodynamically the aircraft is very clean, the swing wing then allows the crew to optimise the lift to drag ratio for a particular mission. The engine inlets are conveniently concealed from look down air intercept radars by the large wing gloves. The swing wing configuration and the rigorous terrain following flight profiles have imposed the need for a very robust structure; this was met by the generous use of very high strength alloy steels, particularly in the wing and wing box structures. It was a lack of experience with these strong but crack prone materials that was responsible for some earlier difficulties with the aircraft, subsequent investigations by the ARL at Fishermen's Bend endorsed the eventual adoption of sophisticated cold proof fatigue testing procedures as used by the USAF (a structural element is chilled to a temperature where it is more brittle and fatigue checks are then carried out). Harpoon equipped F-111C. The AGM-84A is a potent sea skimming anti-shipping missile which outclasses the Exocet in virtually every parameter. Late model Harpoon drops to a very low altitude (cca 2 m, classified) just prior to impact, and maybe launched in range / bearing modes or bearing only modes. The latter mode is exceptionally well suited to use with the F-111C, as the aircraft may use its passive electronic warfare systems to locate enemy shipping from standoff ranges. If the enemy attempts to jam the F-111C's attack radar and activates his fire control radars, he has truly advertised his position. Though the F-111C has four wing stations available, apparently only two Harpoon rounds will be carried, much like the USN A-6E tasked with a similar role. The A-6E will soon receive the AGM-109L Tomahawk anti-shipping cruise missile, with a Harpoon seeker, 1001b warhead and 240 nm range. At this stage the RAAF seems content with the Harpoon, though Tomahawk would offer longer legs and a lot more punch. Structurally there are only minor differences between the F-111C and its US cousins, the wings are longer as in the FB-111A, and the undercarriage and its associate supporting structures are strengthened, again like the FB-111A. The forward fuselage is dedicated to mission avionics, housing the attack radar, terrain following radar, electronic warfare (EW) systems and a lot of supporting electronics. The crew module follows, containing the cockpit and ejection systems. Beneath and aft of it then lies the fuselage weapons bay. This bay was originally intended for nuclear bombs in USAF aircraft, the F-111 would carry a free-fall nuclear bomb in each half of the bay, retaining the wing points for fuel tanks and thus providing both greater unrefuelled strike range and a clean configuration for penetration. The F-111C has an M-61 A1 20 mm rotary cannon permanently installed in the starboard half of the bay, the port side available for a fuel tank or luggage. Aft of the weapons bay we find the main undercarriage well which has two doors, the forward one acting also as a speed brake. The wings sweep from 16 degrees to 72.5 degrees and are equipped with large flaps, extendable slats, spoilers and glove vanes. Though complicated, the system improves takeoff and landing performance substantially. The engine inlets are equipped with moving spikes, the inlet geometry is identical to the F-111A. The engines follow, two TF30-P3 afterburning turbofans. These are 16 stage axial flow turbofans with five stage afterburners, allowing smooth control of thrust from dry military power at 10,000 lb to full afterburner at 18,000 lb. Both may be started with a compressor, or the left with a pyrotechnic cartridge, for bare bones field operation. Bleed air, at high temperature, is drawn from the 16th compressor stage and is used to drive numerous on board systems. The F-111C is a very densely packed piece of machinery, all space otherwise unutilised is taken up by the complex fuel system. The fuel system itself is a remarkable piece of engineering. The forward main tank resides above the weapons bay, containing up to 18,000 lb of avtur. The wing box is used, together with the wings, each wing containing 2500 lb. The aft main tank, termed the saddle tank as it is wrapped about the top of the engines, then contains 9,300 lb. The weapons bay will carry 1,800 lb and either two or four external 600 gal tanks may be carried. This provides the F-111C with a total usable fuel capacity of 34,500 lb, a lot compared to a clean weight of 50,100 lb, comparable to the weight of a DC-9 series 10 airliner. The aircraft has provision for inflight refuelling, a receptacle just aft of the crew module, configured for boom refuelling (USAF) and the fuel system allows for single point refuelling on the ground. The F-111C has ten nominal weapon stations, the 1, 2 outboard left fixed wing pylons (fixed at nominal 26 degree sweep), the 3, 4 inboard pivoting pylons, the 5, 6 weapon bay stations (6 filled by gun), the 7, 8 inboard pivoting pylons and the right outboard 9, 10 fixed pylons. These may carry fuel tanks or bombs. Larger bombs, e.g. 1,000 or 2,000 lb, are carried one per inboard pylon, smaller weapons are carried on Multiple Ejector Racks (MER), e.g. the BRU-3A. The fixed pylons are usually reserved for fuel. Aside from these stations, the aircraft also has fuselage attachment points, aft of the wheel well, for EW or datalink pods. Due to the nature of its role, the F-111 has a rather complicated flight control system, using hydromechanical actuators controlled by electrical signals from a stability augmentation system (SAS), that is in turn controlled by an autopilot slaved to the TFR computer. The SAS is analogue, using pitch rate and normal acceleration feedback, however the system employs self adaptive loop gain (this was chosen to cope with the multiplicity of CG /CP configurations associated with various fuel, wing sweep and stores configurations) and has some quirks, particularly in TF operation (this system was subsequently modified in later US versions). The two-seat, side by side, crew module is spacious and comfortable, an asset which is indispensable when flying long and/or exhausting missions. The view over the nose is surprisingly good, one would anticipate less. Ergonomically the cockpit is exceptionally good, for a sixties design, the pilot having strip (tape) indicators for G/Mach /airspeed and altitude/ vertical velocity clustered around a horizontal situation and attitude display. The navigator then has the attack radar and nav/attack panel in front of him. The TFR scope and EW scope are situated about the centreline of the panel, to allow viewing by both crew members. Both stations have flight controls, including throttles, and the engine instruments lie below the TFR and EW scopes. The side and centre consoles are then occupied with communications, stores control, EW and system control panels. The all important ejection handles reside on the centre console. The F-111C has an extensive avionic fit, with an ARC-109 UHF radio, ARC-112 VHF radio, ARN-52 Tacan, ARN-58 ILS and ARA-50 UHF ADF, together with the AN /APX-64 IFF system. The F-111 is unique with its crew module, as the ejection sequence ejects the whole module away from the aircraft, the module then deploys a drogue chute and subsequently a main chute. Ground impact is cushioned with airbags. The module even has a bilge pump; the RAAF has used the system four times, though one aircraft was lost with its crew. The first aircraft was lost in 1977, when a high temperature bleed air line ruptured, sending a jet of high pressure air into a fuel line, which subsequently ignited. A fire followed, the crew ejecting safely. While this problem was being countered, another aircraft was lost to a different bleed line failure. The aircraft was flying in formation, over the ocean, when the crew registered a 'wheel well hot' warning. They deployed the speed brake to cool the well and began to dump fuel for an emergency landing, however the aircraft caught fire and they then ejected. Apparently, as the story goes, the SAS maintained the aircraft in level flight in spite of the missing crew module and thus upset centre of gravity. However, drag took its toll, the aircraft eventually stalling and dropping into the ocean. It was later retrieved, the cause of the crash identified and preventive measures taken (strange as it seems, the aircraft apparently hit the ocean with a level attitude!). Another aircraft was lost in Ohakea, New Zealand. Both engines flamed out during takeoff, due to water ingestion, the crew then attempted to stop the F-111 by braking, but the tyres lost adhesion on the wet runway and the aircraft could not stop. The crew ejected safely. The only fatal crash occurred at Evan's Head, in 1978. The aircraft was flying very fast, very low and encountered a flock of pelicans. The aircraft experienced severe damage, the crew ejected but it was outside of the safe envelope of the module and both were killed as a result. Birdstrike is a serious problem, the aircraft being vulnerable to hits on the windscreen in particular. To that effect the RAAF has replaced the earlier laminated windscreen with a new flexible type (it was stated by an F-111 navigator, whom I shall not name, that birds actually panic upon seeing the approaching F-111 and attempt evasive manoeuvring that can send them straight into the windscreen ... ). Part of the problem with birdstrike is the extreme speed at which the aircraft hugs terrain. The F-111C is easily supersonic at sea level and accelerates fairly quickly, particularly in a dive. Once through the sound barrier, having used afterburner shortly to get there, the aircraft may cruise supersonic, on dry thrust. Sea level flight at Mach 1.2 is nothing exceptional, one F-111 has apparently been clocked at 947 kts at sea level, or 1.44 Mach! At altitude, the aircraft will reach 2.5 Mach. This is stunning performance, though not to be encountered when hauling 8000 lb of stores. As most combat missions are flown at night, crews prefer dry thrust not to advertise their position with a large plume. Conversely, during daylight missions afterburner is preferred, as the TF30s do smoke in dry thrust. An option also used is one engine in idle, the other set in A/B. The five stage burners are an asset, particularly the lower settings are useful, aircrew calling the first stage miniburner. The aircraft handles very smoothly and is an extremely stable platform at low level. This is due to the high weight which causes very high wing loading at 115 lb/ft2, the highest in any combat aircraft today. The result is both stability and very low gust sensitivity. It is this low level performance, coupled with the aircraft's penetration aids, that allows it to penetrate heavy defences so effectively. The primary penetration aid is TFR, as it is cheaper and in many instances more effective than ECM. Modern Electronic Warfare (EW) systems are a very potent tool when one desires the penetration of an air defence system. Used by skilled operators up to date EW systems can totally disrupt an opponent's defensive measures, rendering acquisition and targeting radars utterly useless. There is a snag. It is much easier to build and instal sophisticated Electronic Counter Counter Measures (ECCM) in ground based installations than in aircraft. Likewise, aircraft have power supply and payload limitations which ultimately constrain the capabilities of its EW fit. Furthermore, the pace at which ECM and ECCM is developed and discarded is very high, and it is very expensive gear. It is therefore necessary to trade EW capability against other options, to maximise overall capability while minimising cost. One very useful option is TFR. TFR systems provide an automatic facility to maintain the aircraft at a constant level above the terrain profile, the lower and faster the better. If the enemy employs ground based radar to direct SAMs, AAA and fighters, it will detect approaching aircraft very late, the rougher the terrain the later. This reduces reaction time, causing difficulties in scrambling fighters or preparing SAMs for launch. The TFR equipped aircraft will however be obscured by terrain features for a large part of its approach, thus the radar will only see it momentarily and can therefore relay only approximate data to fighters or SAM crews. Fighters must therefore search for the target themselves, a no doubt gargantuan task for inept Sukhoi jockeys such as the IA PVO, as they may well lose the little GCI support they have (line of sight UHF radio will suffer the same problems radar does) and must rely on their own radar to find the target in clutter. The TFR equipped aircraft may then employ its ECM to degrade radar performance. If the TFR equipped intruder is moving very fast, it allows little time for head on engagement and chasing a Mach 1 + target at treetop level seldom leads to success. The F-111C is fitted with the APQ-128 TFR system, as used by the F-111D, rather than the original APQ-110 of the F-111A/E. The system operates in the J band and has over ten miles of range. It is a versatile piece of equipment, providing automatic and manual terrain following, manual terrain avoidance, ground mapping and air ground ranging for gunnery. The APQ-128 is split into several assemblies. Two individual dome shaped antennae are mounted on the roll stabilised attack radar pedestal, each of these will sweep up 8 degrees and down 32 degrees while in TF mode. The system is dual redundant, only one antenna scanning at any instant. The antennae are single plane monopulse, generating a dual lobed beam with an 8 degree horizontal and 0.8 degree vertical beamwidth; this allows the resolution of 80 ft obstacles at one mile. The system has a lead into turn ability. The radar measures instantaneous angle and slant range, referenced to the F-111's longitudinal axis. This is fed into the TF computer, together with numerous flight parameters and altitude from the APN-167 radar altimeter. The analogue computer uses these to continuously solve the rather messy TF equation and generate appropriate pitch g-commands for the flight controls, or steering cues for the pilot. The g-commands are roll compensated, to provide the necessary vertical acceleration to clear an obstacle even if turning under several g. As is apparent, safe TF demands very careful energy management not to stall the aircraft while climbing a mountainside, the TFR providing only g-commands. This in fact appears to be the cause of several USAF losses in Vietnam, fully loaded aircraft piloted by inexperienced crews running into hillsides through incorrect application of engine power. To provide the crew with the necessary warning as to the nature of approaching obstacles, the TFR has a scope in the cockpit. This is calibrated in scan angle vertically and distance horizontally, displaying a reference curve and the scanned terrain profile. A skilled operator can interpret the curves easily and use this to accurately judge the size and nature of obstacles. He may then apply engine thrust to maintain the necessary airspeed while the computer generates the g-commands. For manual TF the computer will provide the pilot with a horizontal fly to bar in the gunsight or audio commands to the headset. The TFR may be set for several altitudes from 1000 ft down to 200 ft, the 500 ft setting is configured for weather penetration with the antenna scanning only up to 0 degrees. The operator may set a hard, medium or soft ride. Though each maintain the same clearance over obstacles, hard ride causes very steep climbing and diving between peaks, as compared to soft ride, and is not very comfortable. Crews apparently prefer medium ride as the sensible compromise. The TFR system systematically self tests at the end of each 3/4 second scan, the system also checks radar altimeter operation and checks the altitude against the nominal altitude. If any of these tests fail, the system initiates an automatic 3 g pullup, without roll compensation (you need not trust the antenna pedestal) so the pilot must be alert if he is turning in TF mode. The F-111C's TFR system is quite clearly a robust and effective tool which provides the aircraft with much of its overall capability. The EW systems are a very effective complement. The RAAF are for obvious reasons anxious about revealing the types of EW equipment carried by the F-111C and their respective capabilities. As such the RAAF will confirm only the presence of the ALR-62, ALR-23 and ALE-28 on board the F-111C and will not discuss their respective functions or capabilities. The following discussion is therefore based on available US material pertaining to the F-111A/E with which the F-111C shares nominal avionic/EW system commonality. RAAF F-111C aircraft can carry up to four 600 gal under-wing tanks to extend an already significant radius of action. Mission profile flexibility will be further enhanced later this decade when the RAAF's four Boeing 707s are upgraded to tanker standards. The F-111's defensive system is built around a sophisticated set of radar receivers with the ability to automatically identify, classify and display threats to the crew. Initially the aircraft were fitted with the AN/APS-109A Radar Homing and Warning System (RHAWS). The RHAWS utilised a set of antennae and receivers, the forward set residing under the oddly shaped dielectric panels visible on the side nose panels of early A/ E aircraft, the aft set in the tailplane. Associated electronic modules seemed to be placed in various locations throughout the aircraft. Threats identified by the RHAWS were displayed on a scope in the cockpit, the system controls situated on a small panel above the attack radar. Further information is provided by the ALR-23 Counter Measures Receiving Set CMRS and the critical AAR-34 Infra-Red Receiving Set. The AAR-34 resides in the top of the vertical stabiliser and scans the rear hemisphere for approaching missiles. The system utilises a cryogenically cooled IR detector, with a reticle based scanning system and appropriate filters. Detected SAMs are indicated by a small panel which provides azimuth information on the weapon's trajectory to facilitate evasive manoeuvring. Utilising these systems, the crew may anticipate SAM launch from enemy radar transmission and then evade the missile after launch, if not utilising offensive ECM to confuse it. Where techniques such as manoeuvring and terrain masking fail, the ALE-28 Counter Measures Dispensing Set (CMDS) is employed to release chaff and flares into the path of the missile, or fighter for that. The F-111C's current APS-109A RHAWS is being replaced with the new ALR-62 Terminal Threat Warning System, which is far more capable and equally highly classified. Offensive systems allow the penetrating aircraft to actively jam or confuse hostile radar systems and thus further degrade the enemy's defensive efforts. The F-111 carries the ALQ-94 ECM system, which is fully self contained and combines receiving and jamming subsystems. Antennae are mounted in the wing glove area and rear fuselage fairings. This system is complemented by fuselage or wing mounted ECM jamming pods, the ALQ-87 or ALQ-101. USAF F-111 aircraft are to receive a substantial upgrade in their ECM capabilities with the introduction, in the next few years, of the Northrop ALQ-165 Advanced Self Protection Jammer (ASPJ), a standard fit for the F-18A. Other than ECM, penetrating F-111 s may also launch AGM-45 Shrike anti radar missiles at offending radars or SAM sites; unfortunately this facility has been deleted from the RAAF F-111C. 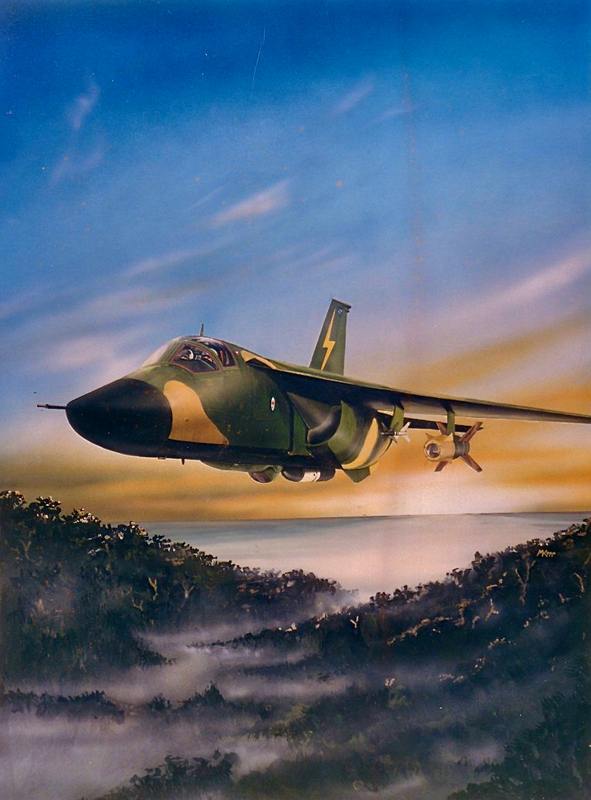 As is apparent, the F-111 is fitted with a formidable array of EW systems; when used appropriately in conjunction with TF penetration techniques, the aircraft may attack any but the most heavily defended targets with virtual impunity. If the RAAF keeps pace with the USAF in the fitting of EW systems, the F-111C will easily counter any existing or projected regional threats. Once the aircraft has penetrated through the opponent's defensive system, it must deliver its payload and achieving that successfully is the task of the Nav/Attack Systems. The AJQ-20 BNS is the core of the F-111C's navigation and attack avionic system. It is tied into the attack radar, stores control system, TFR and autopilot, situation displays and gunsight. Using inputs from some of these, it then feeds outputs to the flight controls and stores control system , subject to selected mode, allowing precise automatic or semi-automatic attacks on surface targets. The AJQ-20 is built around an early generation inertial platform (INS), which uses mechanical gyroscopes and accelerometers to sense the airframe's motion in space. The reference data thus collected is used to maintain the aircraft on a pre-programmed flightpath. Two basic navigation modes are used, Short Range which assumes the Earth is flat, and Great Circle which causes the system to solve a spherical trigonometric equation and account for the Earth's roundness. The former is used for legs up to 200 nm, the latter for longer flights. The AJQ-20 provides several distinct modes for the delivery of free fall bombs, this is very apparent as over one third of the system is taken up by a ballistics computer (BCU). The BCU monitors airspeed, altitude, attitude, vertical velocity, groundspeed, wind and drift and uses these, together with preprogrammed bomb ballistics, to compute the time-of-fall and trail (distance by which the bombs lag behind the aircraft) for the released bomb. This datum is then used by some of the BNS's modes for weapon release. Visual CCIP is a daylight attack mode, where the BNS places the gunsight pipper on the impact point as viewed by the pilot. The pilot then steers the aircraft to where the pipper coincides with his desired target and manually releases his bombs. Auto Bomb is an all weather attack mode and is very commonly used. The operator programmes the target position into the BNS and the aircraft then automatically maintains its heading, overflies the target and releases the bombs. This mode is tied to the attack radar, so that a range and bearing cursor, intersecting at the programmed release point, appear over the radar ground map picture. The operator may then correct for INS drift by using a Tracking Control Handle and placing the cursor exactly over the target. This allows pinpoint attacks on any radar visible targets, such as bridges, runways, large installations and a skilled operator may choose the part of the target he wishes to hit. Where the target is difficult to see on radar the Offset Aimpoint mode is used. In this mode, the BNS is provided with an offset range and bearing, indicating the location of the target relative to some highly radar visible feature (e.g. the Paul Doumer Bridge commonly used by the USAF in Hanoi). The cursors are then placed over this feature and the BNS flies the aircraft over the desired target for bomb release, using the offset figures to estimate its position. RAAF F-111Cs are fitted with an additional analogue memory unit to store multiple sets of offset data so that the navigator need only use a switch to select one of several offsets. This mode is also used when providing all weather CAS for ground forces. Infantry are provided with a portable radar transponder, this device appears on the attack radar scope as a large radar reflector and is used then as an offset aiming point. Infantry must however provide the F-111 with accurate offset figures and also must situate the transponder correctly to ensure success. Given that the crew do not wish to overfly the target and expose the aircraft to AAA and small arms, the Loft Bomb mode may be used. In this mode the BNS is programmed with precomputed lofting parameters for the used weapon. Approaching the target, the BNS issues a pullup command to the pilot, who must then maintain a constant g pullup as indicated by a bar in the gunsight. When the aircraft passes through a programmed pitch angle the BNS automatically releases the bombs, which follow a ballistic curve and then drop on to the target. The aircraft meanwhile continues at constant g until inverted, then rolls level and exits the scene. Other than these options, the aircraft may also Dive Bomb targets if desired. The AJQ-20A represented the state of the art, when ordered in the 1960s. It was superseded in USAF service by the digital solid state AJN-16/AYK-6 in the D and F models, though the USAF retained the AJQ-20 in the A/E aircraft. The system is still effective, though the current state of the art would offer more modes, higher reliability and a more accurate and stable INS, a feature of the AJQ-20 that has been criticised by some F-111 aircrew. The BNS is tied into the F-111C's primary sensor, the APQ-113 attack radar. The AN/APQ-113 Attack Radar Set. The APQ-113 is a late sixties fully analogue multimode radar set and may be operated in both air-to-ground and air-to-air modes. The radar uses a classical dish antenna under the nose radome, mounted on a servo driven gimballing system, that is in turn mounted on a roll stabilised pedestal. The antenna is fairly large, for a 16 GHz band system, and is fed by a strut supported wave guide assembly. As the radar's primary role is detecting surface targets, it has been optimised for this task at the expense of air air capability. In air-to-ground mode the radar employs a specifically shaped main lobe to reduce the amount of energy reflected off near terrain and provide a uniform ground map (PPI) image. Antenna polarisation is horizontal but may be set to circular for weather penetration. The radar offers the best in analogue ECCM capability. The transmitter is pulse to pulse frequency agile (random frequency jitter) with the receiver automatically tracking the frequency of the returns. In other modes, the transmitter may be fixed at a constant frequency and the receiver automatically or manually tuned. If jamming is very intense, the operator may then tune outside of the jammed slice of the band (the auto mode can be susceptible to high power CW jammers). The system is fitted with a sidelobe cancellation feature, an omnidirectional aerial feeds out of phase sidelobe signals, typically jammers, into the antenna feed and then suppresses the jamming signal. The system also allows selective use of a normal radar picture or edges only, this is particularly effective in suppressing barrage jamming. The operator can also manually control the sensitivity of the radar receiver; this is important in maintaining sensible picture quality. The APQ-113 apparently provides sharper imagery than the later APQ-130 fitted to the D model (mature analogue system vs immature digital). In air to air operation the radar uses a vertically polarised narrow pencil beam and the system has modes allowing search, acquisition and automatic single target tracking. The tracking mode then supports launch of the AIM-9B Sidewinder. The radar has no Doppler capability and is ineffective in clutter. The APQ-113 is popular with RAAF aircrew, but does require a very skillful operator to get maximum use of its ECCM capabilities. The radar is inadequate for air-air engagements and could prove to be susceptible to newer ECM systems. Ranging for air to air gunnery is also provided by the attack radar, though for air to ground gunnery the TF radar is used. Ranging information is supplied to the AN/ASG-23 Lead Computing Optical Sight. The ASG-23 represents the final word in USAF collimating gunsights and measures up very well against many HUDs. The imagery is red and green and is comprised of concentric sighting circles and analogue bar graphs, complemented by orthogonal pitch and roll steering bars. The steering bars may be slaved to the TFR or BNS, in the latter instance say for loft bombing or Shrike launch. The LCOS has several modes, notable are dive, loft and level bombing, air to ground rocket launch, Sidewinder launch and A/A orA/G gunnery. The stores control panel in the F-111C differs from the F-111A/E, which uses pushbuttons rather than switches. The system is quite versatile and allows the navigator to selectively release weapons, releasing stations simultaneously or in sequence with programmed delays, in pairs or singles. The RAAF had deleted USAF modes for Shrike, together with nuclear bombs and biological /chemical weapons, the latter two a reminder of this aircraft's alternative roles. As is apparent, the avionic suite on board the F-111C is becoming obsolete, some designs being nearly 20 years old. Conscious of this, the RAAF had intended to subject the aircraft to an avionic system refit, to late model USAF F-111F specification, as part of the planned USAF refit of all A/E model aircraft. This would introduce a digital nav/attack system, better INS, radar and TFR. Unfortunately, this never occurred as the USAF simply ran out of cash and cancelled the programme, with intentions of returning at a later date. That has occurred now, the USAF declaring a full refit on all versions to achieve total commonality throughout the USAF fleet. The refit will see a new digital software programmable system, built around a dual redundant databus. The attack radar is derived from the very new, compact modular multimode GE AN/APG-67 radar, used in the F-20. Featuring fully digital signal processing, dedicated LSI process ing chips and a planar array antenna, the APG-67 is very reliable, small and relatively cheap. In its fighter version it has numerous dogfight modes for gun and missile firing, these will probably be retained by the USAF. The TFR system will be replaced by the Texas Instruments LANTIRN, also equipped with a digital signal processor; the analogue TF computer will also be changed. The cockpit will see greater changes, with a new attack radar display, TFR display nav/attack computer (possibly a newer 16-bit processor), radar altimeter, integrated communications/ navigation/identification system, multifunction display set, Doppler system, all complemented by a new INS and airborne videotape recorder. Modifications to frontline aircraft are to begin in late 1986. Considering the lifetime of the F-111 and the nature of the avionic refit, it will probably be the last major systems alteration the aircraft will undergo. At this stage the RAAF has not stated any intention to follow the USAF with the refit, however it is very likely this will occur in view of the RAAF's earlier intentions to update the aircraft. This work could most probably be performed locally. In the short term however, both the USAF and the RAAF are updating their aircraft with the new Pave Tack FLIR pod, to allow the carriage of precision guided munitions. Pave Tack is a precision infra-red camera system coupled to a laser rangefinder/designator. The whole pod is mounted in a retractable cradle which fits into the weapons bay of the F-111C, the system is optimised for high speed low level flight. The infrared vision system provides a quantum improvement over radar in recognising targets, in all weather, day and night. Once a target is identified the laser may be used to provide very precise target position information or alternately illuminate the target for the release of laser guided munitions. The fitting of Pave Tack to the F-111C will change the layout of the navigator's station, the attack radar panel being replaced by a hooded Virtual Image Display (VID) with 4" and 6" wide CRT screen images. These carry the radar imagery and FLIR picture; the images may be swapped. The pod line of sight may be controlled by the navigator's hand controller, other parameters are controlled by switches on the radar panel, VID hood and console. Pave Tack serves three primary roles, navigation/INS update, target identification/ illumination and acquisition of non radar significant targets. A Pave Tack equipped F-111C would approach the target area with the pod retracted, then extending it to update the INS against some known feature. The pod may then be retracted and then extended or remain extended while approaching the target; upon reaching visual range Pave Tack is then placed into Cue mode. In Cue mode the pod line of sight is slaved to the BNS and thus looks at the target designated by the attack radar/BNS. The operator then swaps images between screens, FLIR to the large screen and takes a close look at the target. Given that he has located the correct target, he may steer the Pave Tack crosshairs onto the desired impact point and engage the Manual Track or Autotrack (only on late model pods, as used by RAAF) modes. In either case the pod tracks the impact point, either computer aided or fully automatic. The F-111C may then deliver its weapons. Lofting is the most favoured technique, avoiding exposure, though dive bombing or simple target overflight may be used otherwise. Given that the bombs released are then laser guided, the navigator fires the laser, about 10 seconds prior to impact. 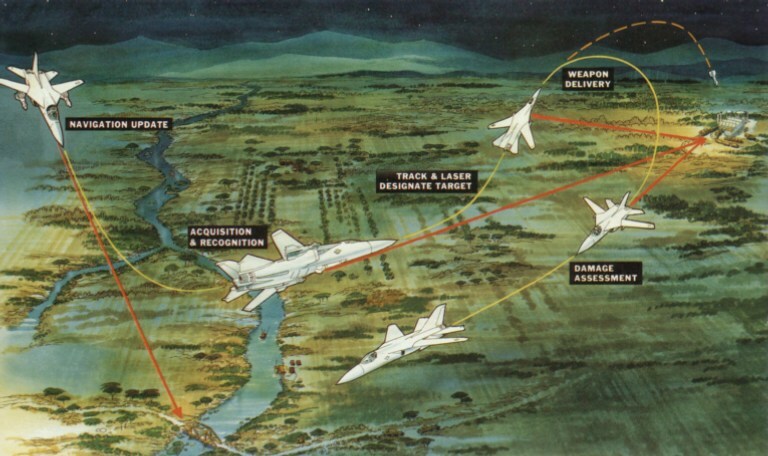 By then the F-111C is exiting the target area, the laser guided bombs subsequently impacting at the designated point with an error of only several metres, the attack videotaped by the built in recorder. The attack completed, Pave Tack is retracted and the F-111C may leave the area in clean configuration. Though this would represent the primary use of Pave Tack, it has other very useful modes. Fwd Acquire mode cages the pod to the pilot's (gunsight) line of sight, Left Acquire mode stabilises the pod along the left wing, 90 degrees off the heading. Right Acquire is identical; these modes all allow the operator only limited pod sightline adjustment and are basically used to locate targets of opportunity for immediate attack. Snowplow mode serves an identical purpose and maintains the pod sightline at a constant angle with respect to earth. 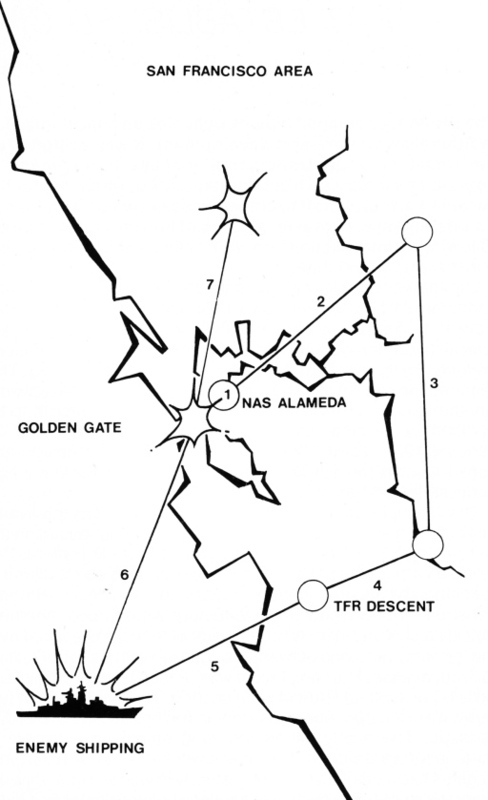 This allows searches along linear features such as roads or railways, a favourite USAF tactic in Vietnam, resulting in widespread disruption of the local transport infrastructure. Pave Tack may also be used to assist in terrain following, using the Terrain Monitor mode which cages the pod sightline to the F-111C's velocity vector and allows the crew comparison with the TF scope. Pave Tack has a built in computer and it is this feature which enables it to also interface with numerous weapons. The GBU-15 glidebomb is one, the Harpoon antishipping missile another. The pressing need for these weapons was one of the primary arguments for the acquisition of Pave Tack. Pave Tack will greatly enhance the capability of the F-111C to hit hardened point targets, this will significantly reduce the number of missions necessary to achieve given military objectives. The quoted force multiplication factor for the Pave Tack/F-111C is around 3, thus a given force will be able to destroy three times as many targets per given number of missions. It is much cheaper than buying more bombers, in the bluntest of terms. The incorporation of Pave Tack in the F-111C's weapon delivery system will however further increase the workload of the crew, which as it is, is significant. That again points to the ultimate need to update the avionic system. The advantage to be gained outside of these considerations is increased reliability, simplification and built in fault locating capability within the avionics. That would greatly reduce the need for support personnel when deployed away from major RAAF bases, not to speak of the significant savings in support costs. Contrary to common belief, reliability is not the main problem of the F-111C - the problem lies in trouble shooting analogue avionics which demands experienced personnel and time, both ultimately costing money. The primary weapon of the F-111C is the free fall demolition bomb, cheap but hard hitting. The RAAF typically carries the 2000 lb Mk 84, and very popular 500 lb Mk 82 bomb. The smaller bombs very often use retarding fins, deployed after release, for very low level attacks. The Karinga cluster bomb has also been tested on the F-111C, but is not part of the current inventory. Upon the introduction of Pave Tack, the F-111C will carry laser guided derivatives of the Mk 82 and Mk 84, the GBU-12 and GBU-10 (see TE, Sept. 1981). A 2000 lb bomb with a delayed fuse will destroy all but the hardest of targets, burying itself deep into the target prior to detonation. The GBU-15 Cruciform Wing Weapon also falls into this family, built around a Mk 84 2000 lb bomb body. The GBU-15 is locked on after release, typically being lofted, by the navigator who views the target through a camera in the bomb's nose. This allows standoff attacks on heavily defended and hardened targets without even the need to laser illuminate the target and thus get into the line of sight of defences. Antishipping missions will involve the use of the AGM-84A1 Harpoon. This long range sea skimmer (see TE, June 1983) enables the F-111C to hit shipping from well outside of SAM range; the aircraft will carry two rounds. Though the F-111C is designed to carry the AlM-9B Sidewinder, the RAAF uses this geriatric tail-aspect-only missile only with the Mirage. The later all aspect AIM-9L may be used if the avionic refit is carried out. That would also allow the F-111C to handle USAF defence suppression missiles such as HARM, currently not compatible with the aircraft. The introduction of Pave Tack will see the demise of the GE M-61A1 six barrel rotary cannon, a well established 20 mm gun with a 100 rd/sec firing rate. The M-61 receives limited use, currently only for proficiency training in air ground gunnery. The F-111C is not well suited to air-air engagements with the gun and these are not practised. While discussing the contents of the weapon bay, the photorecce aircraft do deserve mention. These four aircraft carry permanently installed recce pallets in the bay and have substantially modified cockpits, the centre console losing its throttles. The aircraft are fitted with the KA-56E panned tactical camera, the KS-87 stereo framing camera, the KB-18A 8A strike camera, the KA-93 high level panoramic camera and the AN/AAD-5 IR linescanner. The aircrew have a TV system to allow view of the recce system's field of view which is otherwise obscured by the geometry of the aircraft. These aircraft are fully combat capable. It is significant that the introduction of Pave Tack will further increase the RAAF's recce capability, all of these aircraft being able to record imagery from the FLIR. The primary task of the RF-111C aircraft is photorecce support of the strike force and long range reconnaissance, battlefield recce being the responsibility of the Mirage and later F-18A. In the event of a conflict the F-111s would deploy to forward bases, close enough to hit effectively but far enough to be well out of the range of enemy fighter-bombers and ground forces. The aircraft require little ground support equipment, and will self deploy very quickly (consider Linebacker II) over long ranges. Strike missions require considerable preparation as the crew must select a suitable flightpath and thoroughly assess enemy defences. After takeoff the aircraft climb to an efficient cruise altitude which they maintain until reaching the limits of the defensive zone (usually enemy territory). The crew then initiate a TFR letdown. The one-eleven will go into a shallow 10 degree dive, engines down to idle, until it hits 5,000 ft, where it increases the dive angle to 12 degrees. At 2,000 ft the TFR commands a sustained +1 g pullup until the aircraft descends to its set TF altitude (a trap for the unwary who forget the throttles, airspeed will continue to decrease, AOA will increase and the aircraft will approach the stall), the aircraft then commences its TF run in. A proficient navigator will select an approach path to the target which will avoid defences and if possible place mountains or other features between the aircraft and the nasties. This is obviously not always possible, so the aircraft must use its EW systems if confronted. At this stage the aircraft will be moving at around 500 kts, at 200-300 ft. The navigator is very busy, as he is operating the BNS, looking for the target on the radar scope (it is necessary to select approaches that have good offsets available) and monitoring or operating the EW systems while the pilot handles the aircraft in TF mode. Teamwork is critical. Given the enemy is using ground based radar and SAMS only penetration is straightforward, most radar guided SAMs do not perform well in clutter, IR guided types are better but like tail-on shots. Problems may however occur if the enemy has AEW and lookdown/shootdown radar/missile equipped fighters. Common fighters such as the MiG-21, Mirage, MiG-23 etc. are not well equipped for head on missile shots in clutter, in fact the one-eleven often need only turn abeam to break lock on simpler Doppler radar sets. Newer systems such as the Foxhound /AWG-9ski with the AA-9 missile, supported by AEW, can become a serious problem. The MiG-31 Foxhound has reputedly destroyed drones flying at 200 ft from 20,000 ft in snap down attacks, the AA-9 has active radar terminal homing (probably copied from earIy AIM-54A Phoenix). The F-111 must then make best use of its speed and EW systems, if unarmed. The USAF do not regard this as adequate and the F-111 wing in the UK carry Sidewinders with all aspect capability. It is reasonable to assume that regional Soviet surrogates will acquire these aircraft by the end of the decade and RAAF aircrew are understandably concerned about the current absence of an all aspect air-air missile on the F-111C; the AIM-9L is highly desired. Having penetrated the inner defensive zone, the F-111 then hits the target, using one of the detailed techniques with radar or Pave Tack. The type of bomb used depends both on the target and terrain, the choice always minimising exposure of the aircraft. At this point all hell will break loose as the enemy will have a good idea of the aircraft's location and will fire whatever may be fired. Terrain masking, manoeuvring and EW systems again come into play. It is often at this stage that fighters will enter the scene, having been scrambled late, and attempt to hit the F-111 during its escape. The aircraft's speed and low level handling are usually adequate to shake the pursuer. The F-111 will then exit the area in TF mode until safe to climb. If bounced by a fighter, the aircraft will have to hit a tanker to top up as a lot of fuel will be burned in high speed chases. The current absence of tankers (it is interesting to note Indonesia's efforts to acquire four C-130 tankers) is seen as a severe hindrance to effective F-111 operations, as it leaves the F-111Crews with very little margin for evasive manoeuvring before fuel levels are critically depleted. If the navigator must budget fuel for evasive manoeuvres it cuts into payload and range and reduces the overall effectiveness of the aircraft. This of course represents a worst case scenario, but it is this scenario which the aircraft would have to face as the RAAF will not have the resources to mount massive daylight attacks on heavily defended targets. Maritime strike missions currently demand overflight of the target to drop bombs and this can be risky in view of the multiplicity of SAM and AAA systems carried by modern warships. The introduction of Harpoon will change this as the F-111C may stand off and engage the target in an EW exchange to ascertain its location, in fact bearing is adequate data for Harpoon targeting. Harpoon tactics are under development currently, the maritime strike capability the RAAF will then possess will be unique (a Backfire cannot match the F-111 in low level dashes) and must be considered very seriously by any potential adversaries. In summary, the F-111 is the most potent weapon system in Australia's inventory and is likely to hold that title for some time yet. The aircraft is the ideal type of weapon for a small air force such as the RAAF, it is highly effective in its role and if used correctly would suffer very little attrition (e.g. USAF in Vietnam cca 0.2%). It has the performance and flexibility to carry a wide range of weapons and it may perform various types of strike missions against a wide range of targets. The other strategy of using a large number of simple and cheap aircraft is unrealistic in a modern scenario, Australia cannot afford attrition if combat is to break out, therefore existing equipment must have the ability to survive. The F-111C has demonstrated that ability and is both a powerful deterrent and hard hitting weapon if called upon. The price to be paid for this capability is the resources one must devote to keeping the aircraft's systems up to date and providing the aircrew with the flying time to maintain full readiness. Though this may be seen as considerable by some, they should weigh the other option very carefully and consider the alternative sacrifices to be made. Probably the best appraisal of the F-111 I have ever encountered came from a one-eleven navigator: Were I to ever have to go to war, there is only one aircraft I would choose - the F-111. One of the facilities available to the Amberley F-111C squadrons is a flight simulator. Acquired in the early seventies, it reflects the simulator design philosophy of the period. The simulator is configured for night missions and thus lacks visual capability, its response and handling are close to the actual aircraft though apparently a trifle sluggish. These are not deemed to be deficiencies, though, as the simulator's role lies in procedural training and particularly electronic warfare training. The support crew may selectively induce system failures, rough weather and also produce radar reflectors (as targets) and hostile air defence systems at chosen locations in the San Francisco area. It is anticipated that the simulator will be upgraded with the Pave Tack conversion under way, though it is not clear whether the RAAF will also opt for a visual capability. The RAAF had allocated a full 1.5 hours of simulator time during my visit, enough time to get a taste of low level strike, though hardly enough to fully appreciate all of the various modes the aircraft may be operated in, or to experience the physical sensations of terrain following flight. My pilot and instructor through the mission was Flt Lt Mike Smith, an F-111C Navigator. We took off under the cover of darkness from NAS Alameda, in San Francisco Bay, the aircraft well loaded with 30,000 lb of fuel and four 2.000 lb Mk 84 slicks. Two targets were on the hit list, a surface vessel 80 nm out to sea and the Golden Gate Bridge. The takeoff was smooth, Mike took the aircraft into a shallow climb on reheat, until we reached 380 kts where he pulled thrust back into military power. The first leg of the mission was roughly northeast, cruising at 15,000 ft and 450 kts. This gave me some time to familiarise myself with the attack radar controls and get a feel for finding targets in the groundmap imagery. The radar has a wide and narrow scan pattern, the former used for acquisition, the latter for the terminal attack phase. Image contrast seems to be terribly sensitive to the gain control, though apparently the real thing is far better to use. The orange phosphor does give very good resolution, operational aircraft carry glare hoods. Mike then turned south, while I continued with the stores control and arming panels. The only thing I found annoying was the radar hand controller, which obscures the arming panel when deployed -this would not worry a navigator as he has time allocated to specific jobs and thus clashes won't occur. We then turned toward the ocean, in each instance the headings had to be entered into the BNS. The BNS panel is well situated, the paradox in a so complicated system being the digital indicators which are mechanical (much like an odometer) and servo driven. It takes a bit of skill to get the last digits quite right. With our heading set for the target, just over the coast we entered a TFR descent. The TFR panel is on the centre console; following Mike's instructions I selected the appropriate mode and then leaned back to watch the instruments. In a textbook fashion, the aircraft pitched over and descended, pulling out at 1,000 ft as selected. I then stepped the aircraft down to 200 ft, each time it automatically dropped its nose with the clicking of the selector, levelling out a few seconds later. The TFR scope glowed with its dimly turquoise phosphor, displaying the TF curve. Mike advanced the throttles, to maintain 400 kts, while I set the radar to maximum range to find the target (only possible on the simulator which sees beyond the 200 ft radar horizon). I requested a short supersonic dash, Mike obliged, setting a sharper sweep angle and advancing the throttles into full burner. The simulator generates background noise and the subdued roar of the burners, propagating through the airframe. The fuel flow indicators go all the way and the fuel level indicators move frighteningly fast. Having exceeded Mach 1 noticeably, Mike then reduced power, slowing to 540 kts for the run in. Following his instructions, I armed the slick, fore and aft fused, and selected station 3 (I had intended to use two bombs, I was green, being told one would suffice), raising the selector switch. The switches have backlit numbering, very convenient. Having placed the BNS into Autobomb, I then waited for the target to appear at the top of the scope. That occurred shortly, the cursors were a bit off. That was corrected with the hand controller, which takes a bit of getting used to. Range decreasing, I placed the radar into 10 nm range, selected narrow scan on Mike's advice and corrected the cursors. At 5 nm, I then had to repeatedly update; as the aircraft approaches the target aspect changes and the cursors to different areas of the target. With the target very close, the final update placed the cursor 1/2 deep, halfway across the target, as it slowly drifted into the narrow Vee of the groundmap. With my eyes fixed on the green Bomb Release light I waited only a few seconds for it to flash on. I couldn't help not visualising a hapless Kresta. .. Bombs released, Mike applied full throttle and entered a steep climbing turn while I went through the process of returning the radar and BNS to their respective modes. The AOA alarm sounded briefly, as we momentarily exceeded the safe limit. Having then entered the heading for the Golden Gate, we again tried a supersonic dash, though this time at medium altitude. Bomb drag was noticeable. The weather got quite rough outside, buffeting and lightning flashes became quite annoying. Mike requested they cease. We then descended again into TF, at 200 ft, and began our low level dash toward the coast at 600 kts. Again I set the BNS into Autobomb, and went through the arming sequence for the bombs. They were programmed to train release in pairs, 100 milliseconds apart, to frame the target. The coastline appeared on the scope, but I could not identify the bridge against the terrain. Mike assisted, with a skilled eye, and guided me along the terrain until I found the telltale rectangle. Again I went through the sequence of radar scan and range adjustment, updating the BNS. It was much more difficult as the terrain became more prominent as we approached. Fifteen seconds off the target, I overcorrected and lost it off the scanned area; frantically searching, I found it again. At this stage the aircraft reacted sharply to corrections. Aiming for the southern support, I took my best guess at one third depth and adjusted the cursors. The rectangle disappeared into the wedge, as I rested my hands on my knees and watched the stores panel off to my right. The green 6 went out, as it dimmed the 4 and 5 went out, simultaneously. Bombs released. Mike hit the burners again and climbed away, heading north east. We then dropped again into TF, I selected hard ride, anticipating rougher terrain inland. But time was running out and we were advised that only five minutes remained. Mike suggested a double engine fire and ejection, the crew chief obliged. The fire warnings came on, some telltales came up. Mike retarded the throttles and hit the fire retardant buttons, but the aircraft was dying. He pointed to the ejection handle, which I grasped and pulled. The shoulder straps reeled both of us back against our seats, as the crew module fired away from the stricken aircraft, violently pitching through its programmed sequence. The instruments returned to zero, the outside lights came on. The mission was over. The workload is very high in this aircraft and one only comes to appreciate it fully after trying it out. Given one considers that the navigator must also contend with enemy electronic activity, it is very apparent that the F-111C demands the utmost in aircrew proficiency and very tight teamwork between the pilot and navigator. To quote one RAAF navigator, the F-111Cs limitations do not lie within the aircraft, they lie within the crew's inability to exploit everything it offers. . .' That is painfully apparent. 1 Takeoff from NAS El Alameda. 2 Medium altitude cruise, 15,000 ft/450 kts. 3 Medium altitude cruise, 14,000 ft/450 kts. 4 Medium altitude cruise, 14,000 ft/450 kts. 5 TFR descent to 200 ft, high speed dash, followed by 200 ft/540 kts run in and strike on surface vessel, one Mk 84. 6 Low level run in at 200 ft/600 kts, followed by strike on Golden Gate Bridge, three Mk 84. 7 Low level escape from target area, 200 ft/600 kts, engine fire and ejection.